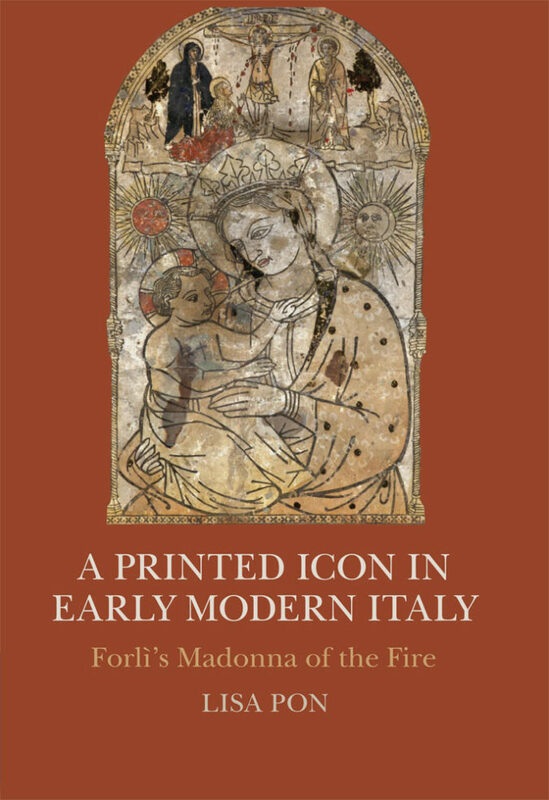 Lisa Pon’s new book tells the densely woven story of a very early, anonymously made, hand-colored, large woodcut of the Madonna and Child surrounded by saints and narrative images of the life of the Virgin and Christ, which seems to survive in only one tattered but much revered example. 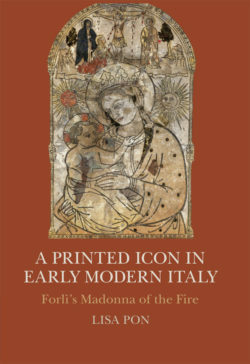 As a contribution to the history of Renaissance prints, Pon’s unique microhistory of the Madonna del Fuoco situates the printed image in the rich context of miracle-working images in various media, modes of enshrinement and the culture of relics, civic pride and political rivalries, monuments, chronicles and festivals, and even the practices of Renaissance fire brigades. The woodcut had been pinned to the wall of a humble schoolhouse in Forlì when a fire broke out in 1428. To the amazement of the local people as well as the bishop who was called from Rome to witness the miracle, the print was unharmed by the flames and remained intact in the smoldering building for three more days. This marked the beginning of the creation of a civic icon. The print was removed from the wreckage and taken to the cathedral where, over the years, it was draped in silver, covered in veils and enclosed in a series of tabernacles crafted from precious stones and metals, these tabernacles themselves enclosed in increasingly more magnificent chapels. As the Madonna and Child at the center of the image came to represent the favored status of the city, as the image’s cult grew in importance and spread beyond Forlì, and as the number of publications and festivities around it multiplied, the entire city became focused on the simple icon in its magnificent series of enclosures inside the cathedral. 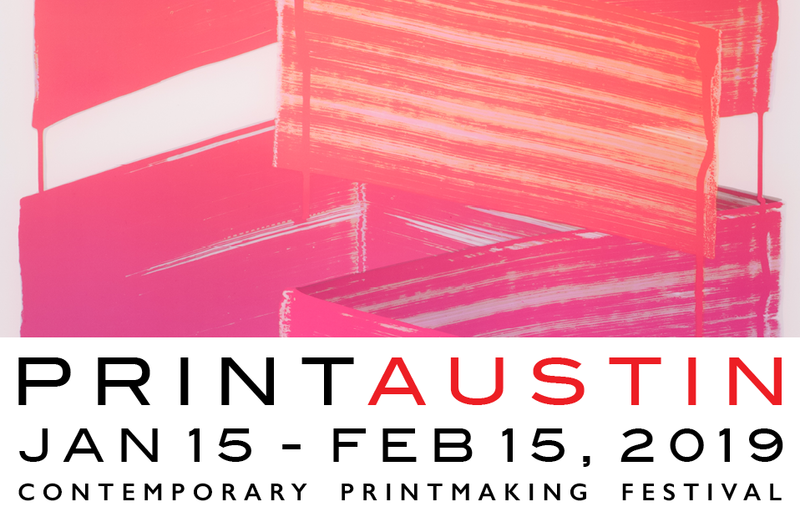 Multiplied over the centuries through diverging legends, ritual veneration and substitute images in many media, the early 15th-century woodcut became the focus of attention of architects, sculptors, painters, chroniclers, archbishops, popes, cardinals, confraternities, urban planners and other printmakers who took on the housing, celebration and veneration of the miraculous print. 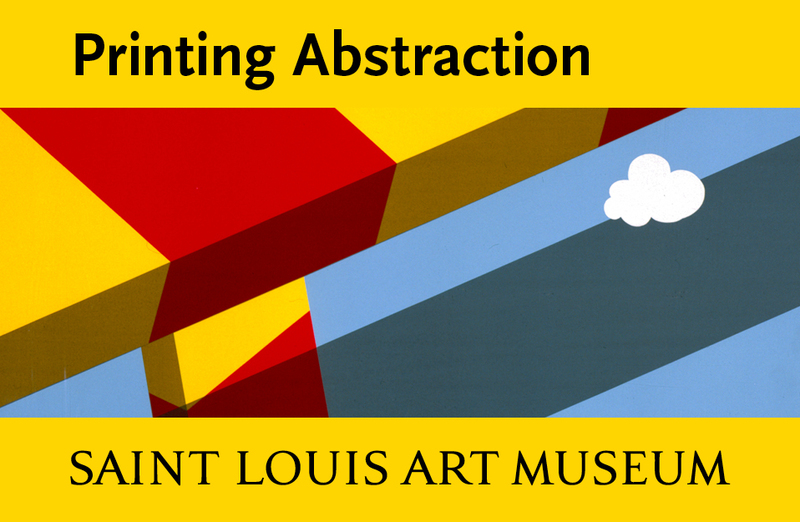 While its origin may be unknown, the woodcut’s destination and replication has provided Pon with a diachronic narrative of the power of a single image, almost invisible now in its multiple encasements, but knowable through its substitutes and the historical attention that she and those who have approached the topic before her have given this unlikely protagonist.